X-Ray Photoelectron Spectroscopy (XPS Analysis), also known as Electron Spectroscopy for Chemical Analysis (ESCA), is used to determine quantitative atomic composition and chemistry. It is a surface analysis technique with a sampling volume that extends from the surface to a depth of approximately 50-100Å. XPS can also be used for sputter depth profiling to characterize thin films by quantifying matrix-level elements as a function of depth. XPS is an elemental analysis technique that is unique in also providing chemical state information for the detected elements, such as distinguishing between sulfate and sulfide forms of sulfur. 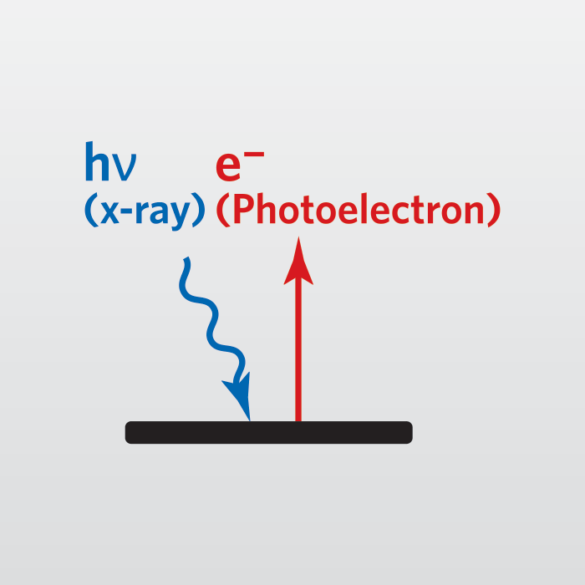 The process works by irradiating a sample with monochromatic X-rays, resulting in the emission of photoelectrons whose energies are characteristic of the elements within the sampling volume. EAG uses X-Ray Photoelectron Spectroscopy in a variety of applications to help customers, across a range of industries, with R&D, process development/improvement and failure analysis. These insights into a sample’s chemical makeup allow you to make product and process improvements more quickly, enabling you to reduce cycle time and save money. With EAG, you also have access to the best facilities, instruments, and scientists available for performing XPS analyses. We handle many different materials from multiple industries, giving us a very wide range of experience. Plus, our person-to-person service ensures that you will receive answers to all of your questions.